Making Fresh Zoodles aka Zucchini Noodles! A couple of weeks ago I wrote about how I’m trying to get into cooking. I’ll be honest and say that progress is slow, but I am putting together a meal from scratch here and there. I bought a cheap ($12) spiralizer off of Amazon not really knowing what to expect. 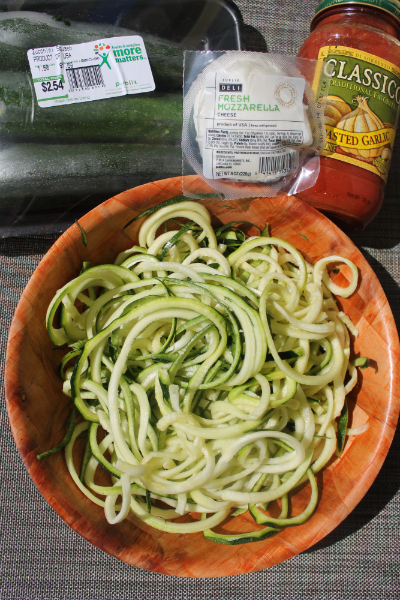 Luckily for me the spiralizer is super simple to use and my zoodles came out looking great, haha. Well, at any rate they look the same as the zoodles that more expensive spiralizers make! In hindsight I wish I would have also made meatballs – that’s definitely on my list for next time. The cooking time for zoodles? Like practically non-existent. 2. 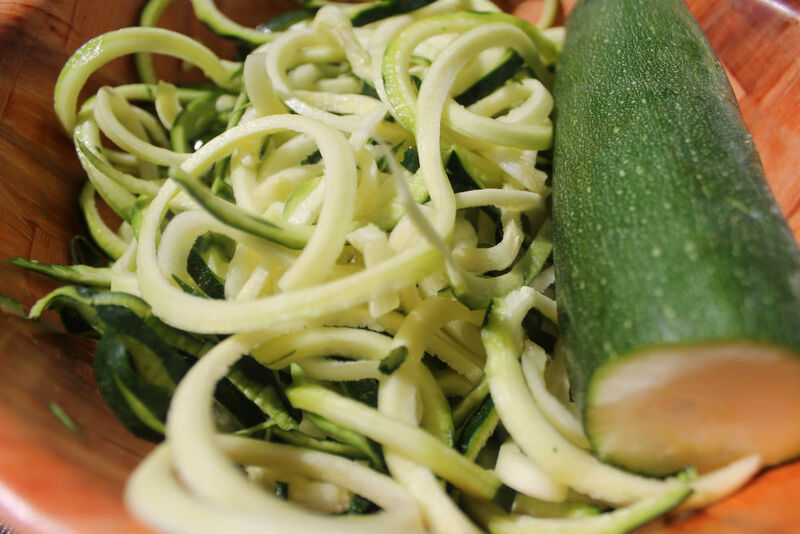 Warm zucchini in microwave for about 90 seconds (mix zoodles every 30 seconds to evenly distribute the heat). 3. Slice up a few chunks of mozzarella. 4. Once the zoodles are warm enough mix the sauce and mozzarella in and you’re done! It’s really that easy! Voila! It may look like more than 2.5 normal pasta servings, but since these noodles are just zucchini you’re definitely going to eat more than you would with regular pasta to feel full. I guess because I didn’t really cook my zoodles long they still had a bit of crunch to them which I liked. They absorbed the flavor of the sauce really well and tasted almost exactly the same as regular pasta. I’ll definitely be making this dish again! 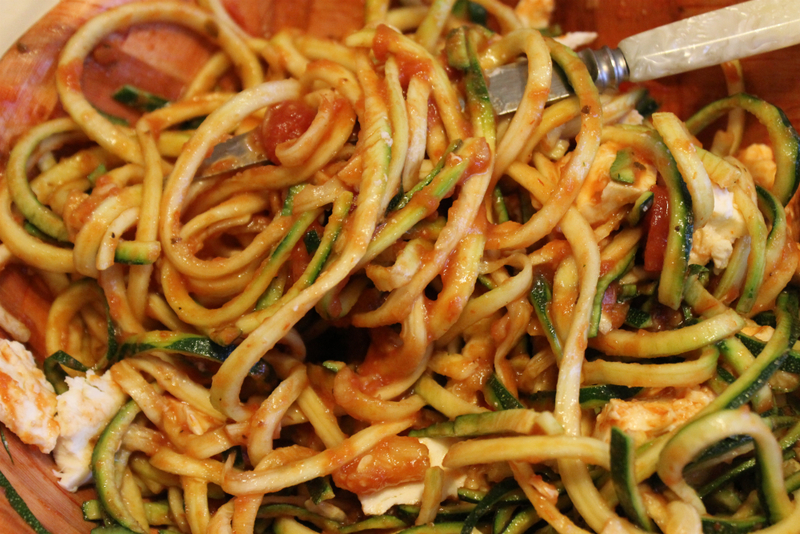 Have you ever had zoodles or make noodles from a different type of veggie? I’ve only made spaghetti squash with some good pasta sauce, which I really liked. 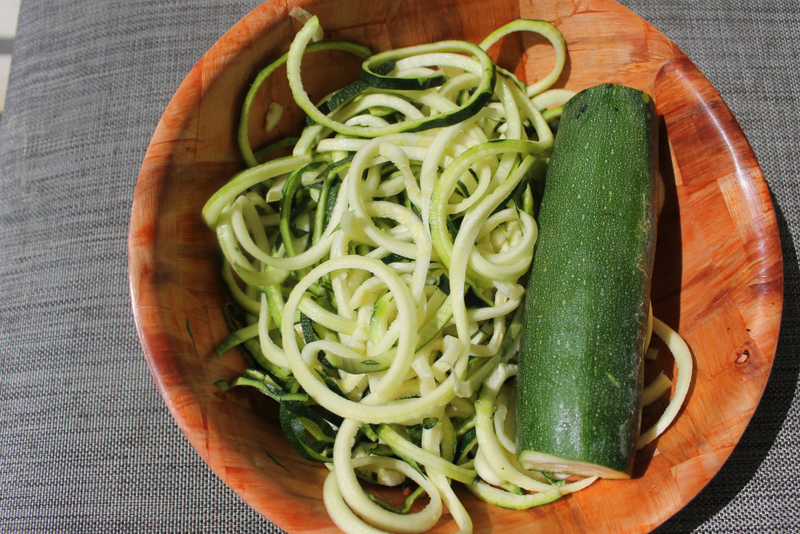 I need to buy a spiralizer to make zucchini noodles! Plus, the term ‘zoodles’ is too good to pass up. I really need to try spaghetti squash. I’m been hesitant and I have no idea why since I love squash! I have used spaghetti squash, it is really good. I, too, am gluten free. I make the GF pasta but overload it with veggies–that helps too. That “zoodlizer” (don’t you think it should be called that?) looks fun. However, I am not lacking in the kitchen gadget department–I am on a kitchen gadget shopping freeze. I LOVED watching the zoodles come out of the little machine! It was kind of crazy… like a pencil sharpener but for zucchini! That looks yummy! It’s funny I had zuke last night but not in noodle form. I have done spaghetti squash in noodles but one time it went bad in my fridge and it stink so horribly that I can’t bring myself to eat it anymore! I wish I had grown yellow squash and zuke in my garden. Next year! I’ve never had spaghetti squash… I bought one but never used it. I guess I threw it away just in time because I don’t think it was ripe any longer but it didn’t start smelling bad either! Ohhh I never thought to fry them up! That sounds so good! I may have to try this just because the word zoodles is awesome lol. Delicious and super easy to make is a huge plus, always looking for those types of recipes. We love meatballs so that is a must! Yes! I have no clue why I didn’t think to make meatballs. I guess I was just too excited to use the spiralizer that I forgot about the good stuff! I bought one of the cheap spirilizers too but still haven’t tried to make zoodles – I will have to test it on the boys – not sure I can make enough to fill to growing teenagers!!! I would definitely add meatballs if you’re going to feed the boys! 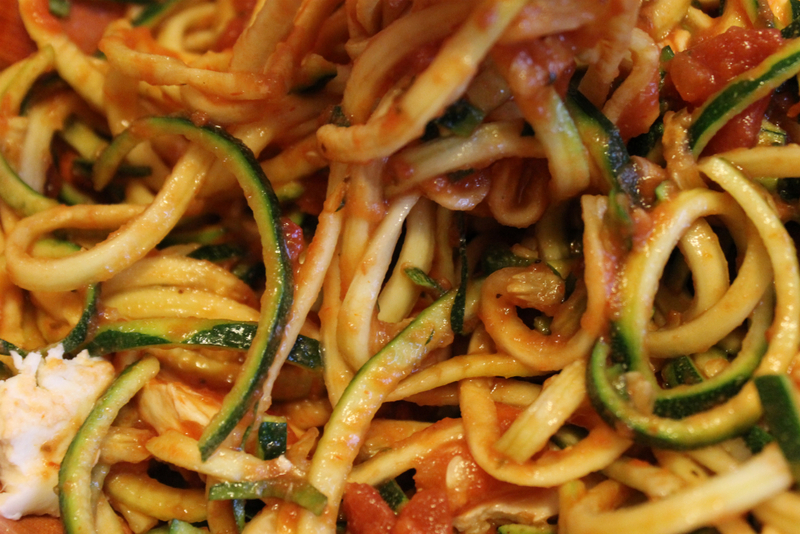 I ended up having quite a bit of the zoodles by myself… way more than I would if I were eating normal pasta! OMG I’ve been wanting a spiralizer but always thought they were too expensive! Would you recommend the one you have? My mom makes awesome zucchini pasta with pesto, sundried tomatoes, chickpeas, and feta cheese! We make these a couple of times a week, although we call them courdooles, as they are called courgettes over here. Courgettes! That sounds so much fancier than zucchini! All my running friends seem to be into zoodles these days. I need to try them!! What an easy, cheap, and relatively healthy dinner! Zoodles are the new spaghetti squash, haha. Last night at my running club picnic I had chocolate cupcakes with zucchini in them. It was actually good! I guess the zucchini keeps the cupcakes moist. I’ve been doing this a lot lately, obviously with all my zucchini! Sadly, I am lacking a fancier noodle-r so mine do not look nearly so nice!